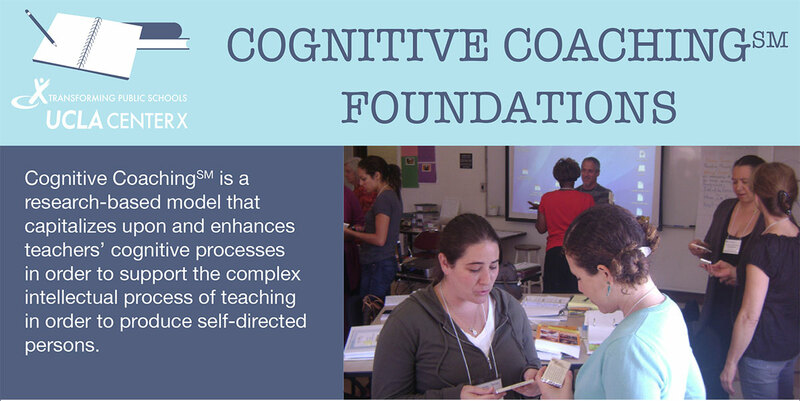 For educators who have completed the Cognitive CoachingSM Foundations Seminar, the Advanced Cognitive Coaching Seminar provides participants with deepened knowledge and skills for refinement of a coach’s meditational toolbox. This 6-day seminar brings the expertise of Director Emeritus of Thinking Collaborative, Jane Ellison, and the knowledge of Center X Associate Director of Instructional Coaching Programs, Natalie Irons. Registration is closed since we have reached capacity. <!–Register–>Pay by credit card or purchase order. NO REFUNDS will be issued five business days prior to the start of the Seminar. Jane Ellison is Director Emeritus of Thinking Collaborative. She presents workshops nationally and internationally to educators on Cognitive CoachingSM, Adaptive Schools, change and transition, presentation skills, facilitation skills and quality professional development. She is co-author of two books on applying Cognitive Coaching in schools and a contributing author to the 3rd Edition of Cognitive Coaching: A Foundation for Renaissance Schools. Natalie Irons is a Training Associate for the work of Cognitive Coaching and Adaptive Schools and is Associate Director of Instructional Coaching Programs at UCLA Center X. She is co-author of Samantha Spider: Using All Your Senses, a children’s book about one of the Habits of Mind. She is also a National Board Certified Teacher and owner of Chrysalides Education Services.